To make your patterns more readily discoverable by fellow pattern aficionados—and search engines too!—we always recommend adding a descriptive title, comments, possibly a longer description, and all the appropriate tags you can find. The last is the most important, as your patterns will be listed under all the relevant categories, giving them a wider visibility. For the list of available tags, click “Tag definitions” in the Share dialog or go to the Artlandia Glossary in your web browser. 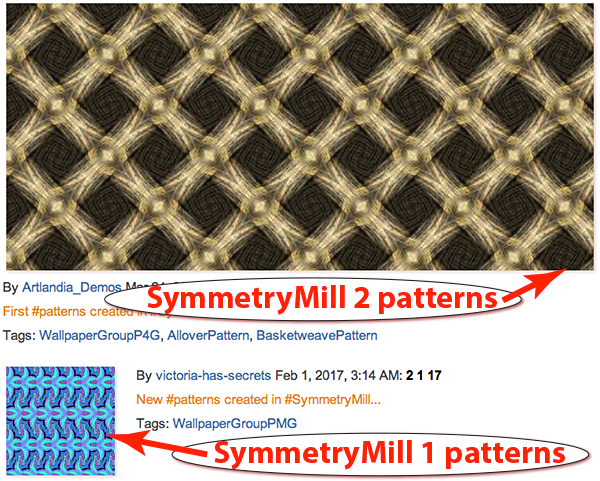 In just a few moments, when your shared patterns go live, you’ll immediately see the first big difference (pun intended): SymmetryMill 2 patterns are allotted a much larger space in Pattern Central listings. The home page for your patterns will also show a bigger picture of the first three patterns in a each set. 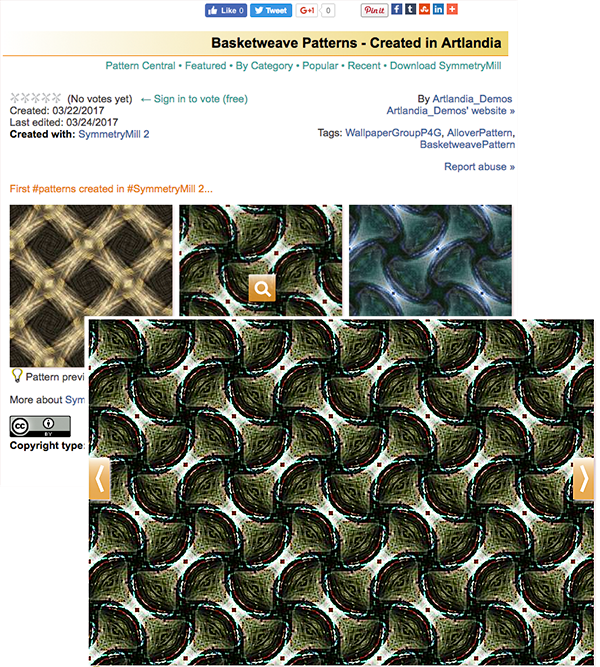 A home page of patterns created with SymmetryMill 2. 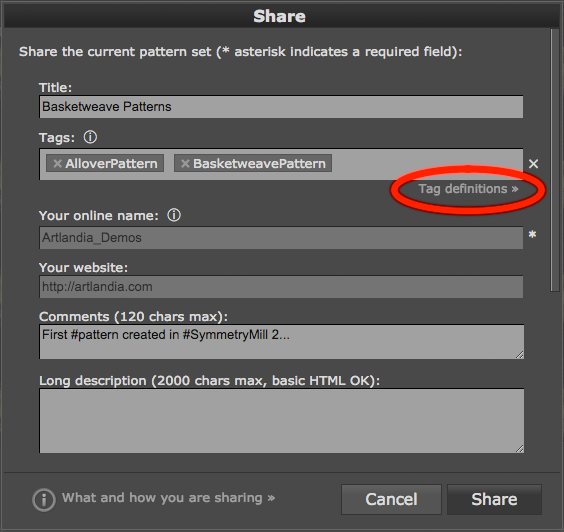 When sharing your first patterns, do fill in your website address in the Share dialog. That way your shared patterns will link to your website, helping all of us to create a stronger pattern design community! 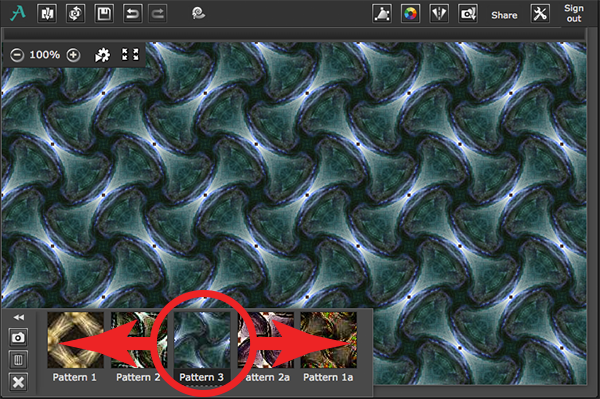 Now, in case you are wondering about patterns you shared from SymmetryMill 1.x earlier, you can always update (re-share) the patterns from the new app to take advantage of the enhanced display. 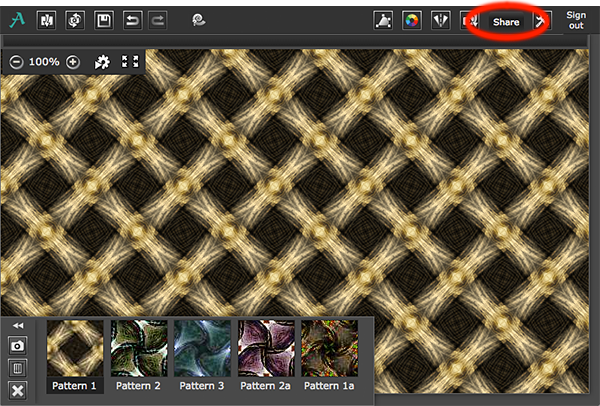 Simply drag the pattern home page to SymmetryMill 2, make any changes you want (or leave the set as is), and click the Update button. Loading shared patterns in SymmetryMill. Ready to try? Be sure to download the latest SymmetryMill and get busy!